Addie is the little girl in the blue dress! I was looking through some postings from 2012, and found this lovely tribute to Addie, my CureJM kid who was the basis for my CureJM Fundraiser. Addie is now a thriving, beautiful teenager, still battling this disease but has it much more under control. We are still looking for that cure! This entry was posted in Award-Winning, Bullying, Children's Picturebook, Consideration for Others, CureJM, Friendship, Kalpart Illustrations, Kid Fans, Manners, Myositis, Picture Book, SBPRA, sherrill s. Cannon, Uncategorized on December 14, 2018 by Sherrill S. Cannon. This is Emma, who has had to fight not only Juvenile Myositis, but Leukemia! Emma Conley has also just been named the Mid-Atlantic States Miss Heart of the USA the “2017 Wise Country Petite Miss Heart of Freedom”! Please remember that everyone can help by getting great books for kids and grandkids (and their friends) and support CureJM – Juvenile Myositis, an incurable children’s disease – at the same time! 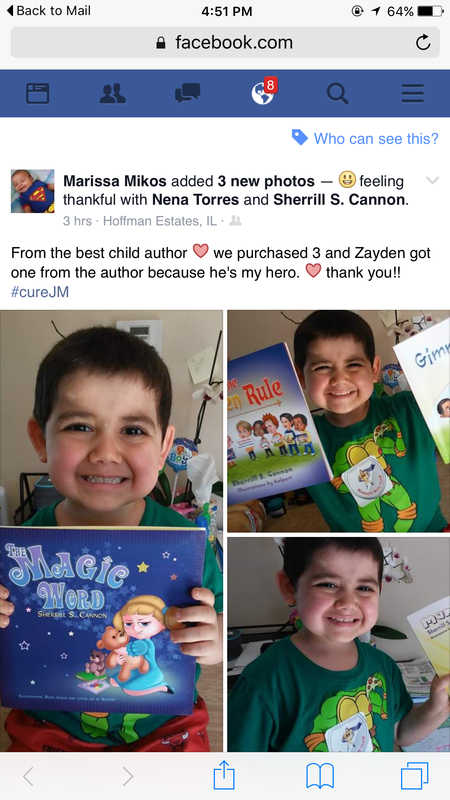 Please visit the on-going CureJM Fundraiser at http://sbpra.com/curejm where 50% of the cost of my award-winning children’s books goes to the CureJM Foundation. The names of many JM kids are included in my newly released 2017 book, “My Little Angel”. Please help us find a cure for kids like Addie, Alyssa, Brookelyn, Cassie, Daisy, Dmitri, Eldon, Emma, Jaden, Kinser, Tristan, Zayden and all the other JM kids – and the many adults who also have this horrible disease!!! This entry was posted in Angel, Children's Picturebook, Consideration for Others, Fundraising, Guardian Angel, Kid Fans, Myositis, Picture Book, Review, Reviews, sherrill s. Cannon, Uncategorized on July 2, 2017 by Sherrill S. Cannon. Thanks to my Kid and Teen Reviewers for Sharing! Thank You Ashlyn and Cassandra! This entry was posted in Award-Winning, Behavior, Bullying, Children's Picturebook, CureJM, eBook, Fundraising, Kid Fans, Manners, Myositis, Picture Book, sherrill s. Cannon, Uncategorized on November 23, 2016 by Sherrill S. Cannon. I was delighted that Facebook offered me the opportunity to identify my friends! 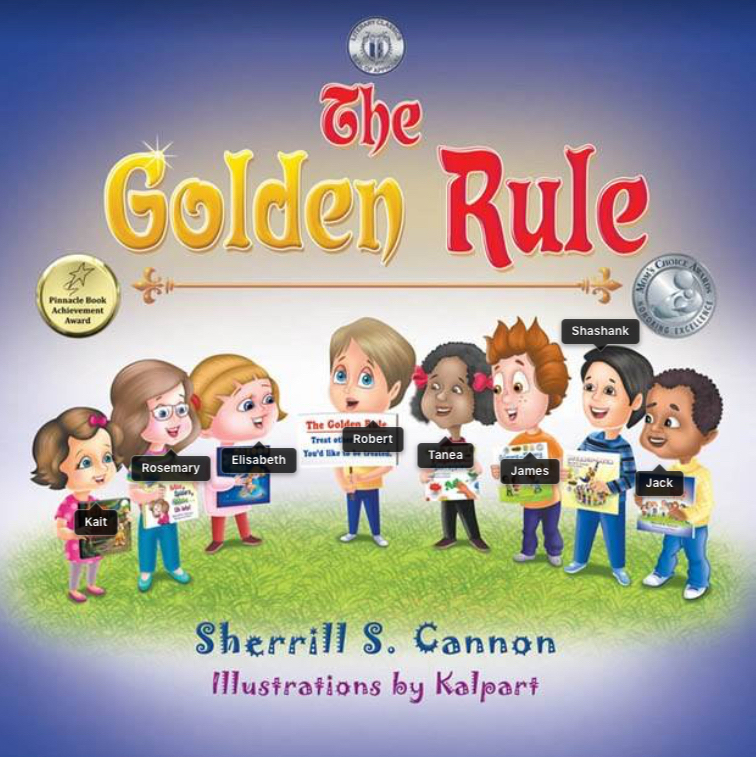 This entry was posted in Award-Winning, Behavior, Bullying, Children's Picturebook, Consideration for Others, CureJM, eBook, Golden Rule, Kid Fans, Manners, Myositis, Picture Book, sherrill s. Cannon, Uncategorized on June 18, 2016 by Sherrill S. Cannon. So happy to see this from Zayden’s Mom on Facebook, and wanted to share! Zayden is a Superhero on the Manner-Man Team! He’s wearing his Manner-Man Badge also! 50% of the cost of the books goes to the CureJM Foundation to help find a cure for this so-far incurable children’s auto-immune disease. You can also leave a name for any child or adult you would like acknowledged in my next book, along with Zayden and his sister Lily, as well as Jaden, Matthew, and Alyssa. This entry was posted in Award-Winning, Behavior, Children's Picturebook, CureJM, Fundraising, Kid Fans, Manners, Myositis, Picture Book, sherrill s. Cannon, Superhero, Uncategorized on April 26, 2016 by Sherrill S. Cannon.